In the old days, tipis were made with buffalo skins and pine trees. The native Indians built fire inside tipis to cook and keep warm when the temperature was cold. 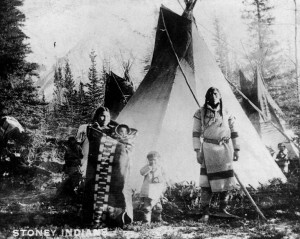 The smoke chimney, an opening in the middle of the tipi, would allow fire smoke to escape. Sometimes, the air pressure from the heat would keep moisture and light rain away from entering the tipi. However, when it rained heavily, the smoke chimney needed be closed tightly to prevent majority of rain from coming in; the rain water that touched the poles would glide along the poles down to the ground. 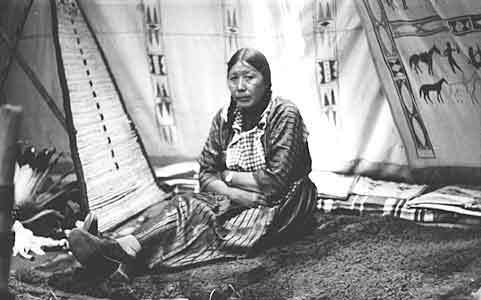 For flooring, native Indians used buffalo skins as mats to cover the ground. The top of tipi was blackened due to the smoke from fire. 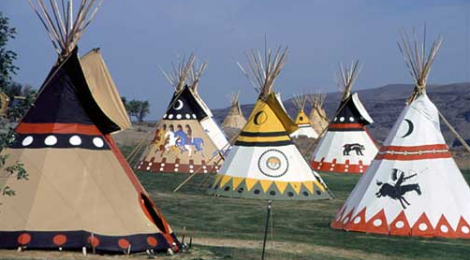 In the modern days, tipis are built with similar structure, except it has additional “top rain canvas” that will direct all rain water away from the tipi, where as in the past, the native Indians only had the bottom rain cover. In addition, an elevated wooden platform is used in the modern days to keep the floor dry and clean instead of using buffalo skins as floor mats. In the State Park, you are not allowed to build fire inside tipis. To satisfy your curiosity about Native American’s Tipi and how it works in details, check: The Sioux Tipi. 1. Convenience — You do not need to pack/unpack your tent upon arrival/departure. 2. Unique Experience — It is a unique and fun experience to stay in a tipi, especially when the tipi is clean and the weather is just right. 3. Spacious — Tipi is tall and spacious compare to most tents on the market. 1. Holes/openings and bugs/mosquitoes — Tipi’s doors and edges have holes where small animals and critters such as lizards, bugs or mosquitoes can crawl inside your tipi, especially when the temperature is warmer. You could bring a mosquito net with you, but that beats the purpose of having the convenience. 2. Rain — Check the tipi’s rain canvases when you first arrive. If the top and bottom rain canvas do not have big overlap, the rain water might get into the living area. Moreover, make sure you set up the rain canvases properly. There might be an instruction inside the tipi that shows you how to use the rain canvas. 3. Cleanliness — You still need to prepare a tarp just in case the floor is wet or sandy. 4. Cost — Renting a tipi costs more than renting a camp site. In conclusion, I personally enjoy staying in a tent better because it is bugs-free, waterproof, and gives me a peace of mind when I sleep at night. Of course, if you enjoy staying in a tipi and do not mind finding a way to go around the challenges, you should continue exploring the fun. Regardless, it was an interesting and great experience for us staying in a tipi. However, it did not provide the comfort and convenience I was looking for as compare to staying in a tent. ← Tipi – Part 1: How It’s Like to Stay in One?